Flux Player allows you to watch MeMoves content on your computer and/or mobile device. Download Flux Player on each device on which you want to watch MeMoves. Download links for each operating system are below. Download and install Flux Player at the link below, go to Applications, open the app, then sign into your account. Requires Apple macOS 10.7 or newer. Download and install Flux Player at the link below, go to Programs, open the app, then sign into your account. Requires Microsoft Windows XP or newer. Download and install Flux Player at the link below, open the app, then sign into your account. Requires Apple iOS 8 or newer. Download and install Flux Player at the link below, open the app, then sign into your account. 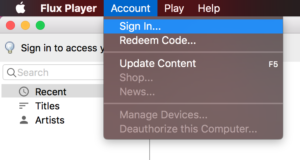 Open Flux Player, go to the Account menu, then sign into your account using your username and password. After signing in, your MeMoves content will begin to download. It may take a few minutes for both the video and audio conent to finish downloading. You will only need to log into your account once to download MeMoves content. Once MeMoves is downloaded, simply open Flux Player, click play, and enjoy. For additional help, contact us at [email protected].